NEW investments and surging property prices in Johor have led WCT Bhd to embark on a fifth project in the state, which will have an estimated gross development value of RM1.5 billion. 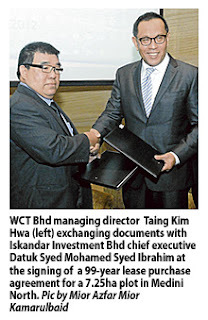 WCT, through its subsidiary WCT Acres Sdn Bhd, yesterday signed a 99-year lease purchase agreement with Iskandar Investment Bhd (IIB) for a 7.25ha plot in Medini North in Iskandar Malaysia for RM99.47 million. The RM1.5 billion mixed commercial project will comprise office spaces, retail components and apartments, to be developed over five years, starting from the third quarter of next year. "We hope we can go upmarket with this project and attract foreign investors from the neighbouring city state," WCT managing director Taing Kim Hwa said at the exchange of documents with IIB, the master developer of Medini. WCT's maiden property project in Medini North is called 1Medini Residences, comprising two residential buildings worth RM400 million. The first block, launched at RM450 per sq ft in January this year, is fully sold. The second block, which was launched at around RM560 psf in April, is about 90 per cent sold. According to Taing, 40 per cent of the total 644 units were sold to foreigners. Taing said in the first quarter of next year, WCT will be launching Medini Signature, featuring 456 luxury apartments worth a combined RM400 million, or starting from RM600 psf. "Property prices have been increasing in Medini. We are excited at the prospects Johor has to offer as well as the future of Medini. We have confidence with developments in Medini which we think will give us reasonable returns," he said. Taing said the company is currently enjoying profit margins of between 20 and 30 per cent from its projects in Medini North. The remaining two projects in Johor by WCT are slated for launch next year and in 2014. The projects are located at Jalan Skudai and within the Medini Business District, next to Medini North. IIB chief executive officer Datuk Syed Mohamed Syed Ibrahim said some RM3 billion investments have come into Medini, with a significant portion contributed by Singapore. Syed Mohamed said there is also rising interest from the Japanese.